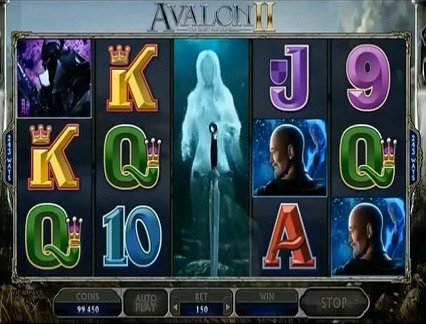 Game Information: Avalon 2 is the highly anticipated follow up to Microgaming’s much-loved original Avalon themed pokie. 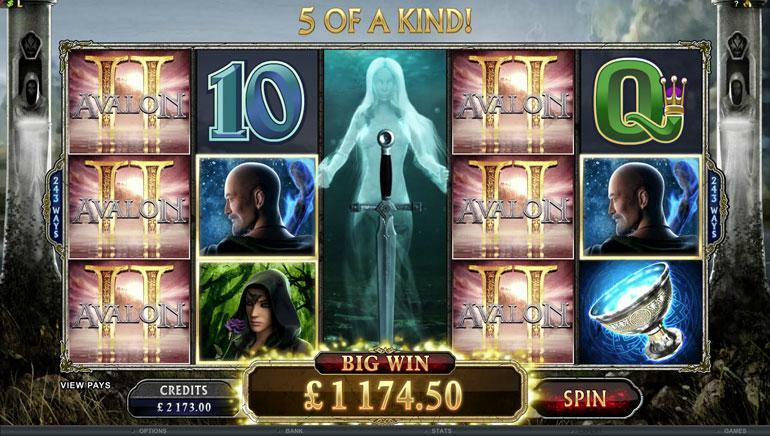 This time however the designers at Microgaming have taken the enchanting and mythical world of Avalon into the realms of 3D animation. Microgaming have also added all-new bonus features including two bonus features in the base game and a whopping eight bonus features in the bonus round of the game! Microgaming launched Avalon 2 – The Quest for the Grail in 2014 to critical acclaim and it did not take long for this follow up title to become one of the most played games at Microgaming online casinos. Avalon 2 offers an exciting base game with two randomly triggered bonus features which include the Merlin feature and the Grail Bonus feature. The Grail Bonus feature opens up an entirely new world of no less than eight bonus features/games to really boost winning totals! Avalon 2 features two randomly triggered bonus features in the base game which consist of the Merlin special feature and the Grail Bonus Game. Merlin, the mythical magician and Arthur’s most powerful friend and ally can appear anywhere during the base game of Avalon 2. When Merlin appears he can either award multipliers or a random cash prize. Merlin can award a cash prize on a non-winning spin of anything from 4-20 times your stake and on a winning spin, Merlin can award a multiplier of 2 -4x your winning total. The base game of Avalon 2 also features an expanding wild which can appear on the middle reel of the 5 reels. Lake of Legend gives you the opportunity to re-forge the legendary sword, Excalibur from fragments by rolling die. The numbers on the dice correspond to certain sword fragments, match the two and watch the fragment move into the re-forge window. You have a total of 10 rolls of the dice and each number you get also matches a multiplier (5 = 5x multiplier etc.). If you manage to re-forge the sword complete you win 15x your stake. Mist Vales gives you 15 free spins with a 1x multiplier and you get to choose your wild symbol for the round. The extra wild that you choose also gives you another 2x wild multiplier for even bigger winning potential. Whispering Woods allows you to pick one of five different shields, each shield represents a different multiplier strength which range from the lowest 10x multiplier all the way up to an incredible 160x multiplier of your original stake. Forest Falls gives you 20 free spins with a 1x multiplier. This round also includes the Avalon 2 icon wild symbol which is the Trailing Wild and, when it lands on the first or second row on any of the reels, it will expand down and stay there for one spin. Dusky Moors sees you having to match two helms of the same kind out of twelve different items on screen. Each helm offers a multiplier which can range from 6x up to 20x your stake. Morgan’s Keep gives you 20 free spins with a 2x multiplier as well as Microgaming’s Rolling Reels feature. This means that consecutive wins will increase the strength of the multiplier from a starting 2x and increase it to 3x, 4x, 5x and 6x on each free spin. Hall of Shadows gives you a cash prize for every move that you make and, depending on how successfully you block or attack, the size of the prize will vary. The goal is to defeat the Black Knight and retrieve the Grail. Isle of Avalon lets you spin different wheels to get the highest bonus multiplier that you can. There are four different wheels and the trick is to unlock the fourth wheel by getting a zero on the third wheel. Avalon 2 offers 3D graphics which really enhance the original idea and take to a new level of gameplay with a more realistic and more engaging quest feel, similar to Lord of the Rings or other popular adventure quests that have recently become popular again. Fans of other Microgaming slots like Thunderstruck 2 or Immortal Romance will love the sound and graphics of this game, with plenty of romantic drama and mysticism to enjoy!